Do you need an expert to run cables for your office? Structured wiring allows your company to run at optimal condition with little to no downtime, while keeping your company within legal codes and getting your physical network up to date. Whether you need a single cable run for a new addition, or you have an entire building prepping for an office move, structured wiring is an essential step in continuous technological improvements. 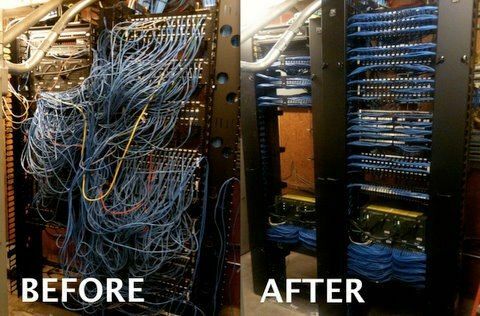 As a result of having proper structured wiring, you will see many improvements in your business. It will support continued business growth, enhance flexibility when it comes to improving performance because it can quickly and easily accommodate moves, adds, and changes, reduce the risk of downtime due to human error and mistakes with unorganized cabling structures and much more. Consequently, structured wiring will free you from the risks that come with an unorganized work environment. Your company deserves accuracy and reliability when it comes to wiring. Our Mission at DIS is to deliver IT Services that assure your success is our success.